Filters will isolate the results on the report to just the selected Employee(s) or the selected cost center or Division/Branch/Dept/Team (DBDT). Choose one or multiple; if none are selected the report will show all data unfiltered. - Sorting: by default most reports will show employees listed in alphabetical order, but you could show them by employee code or even SSN. - Group Level: if instead of listing employees by alphabetical order across the entire company you would like to show them alphabetically by their home department; you might adjust the settings to Group the employees by a cost center level. - Group Type: your options here are "Summary", "Summary Detail" and "Detail". If for instance, you only need the costs for your group "DBDT/Company" and are not concerned with viewing the detail or employee data that consisted those numbers; you would run in "Summary" mode. Let's say you would like to see the labor cross for the entire year 2015, but only for your Kitchen Staff or Back of House; then you could filter the report and change the settings on the Group Type to Summary. This would give you a clean 1 page report instead of a very large report showing all kinds of data for the entire year. 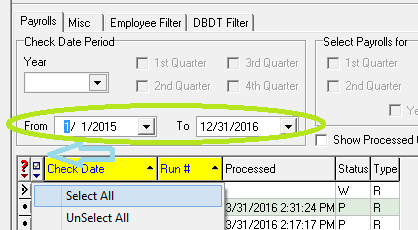 - Show only Summary for Multiple Check Dates: this is used normally in conjunction with the Group Type "Summary Detail" as instead of listing every individual check across the date range for every employee; this option will allow you to see the earnings detail or employee data, but will summarize it by employee for the year. Shorting the report again and perhaps giving you the earnings total you seek quicker. Side Note: Labor Distribution reports for instance naturally are attempting to display the labor costs by cost center and thus are generally grouped by a DBDT. 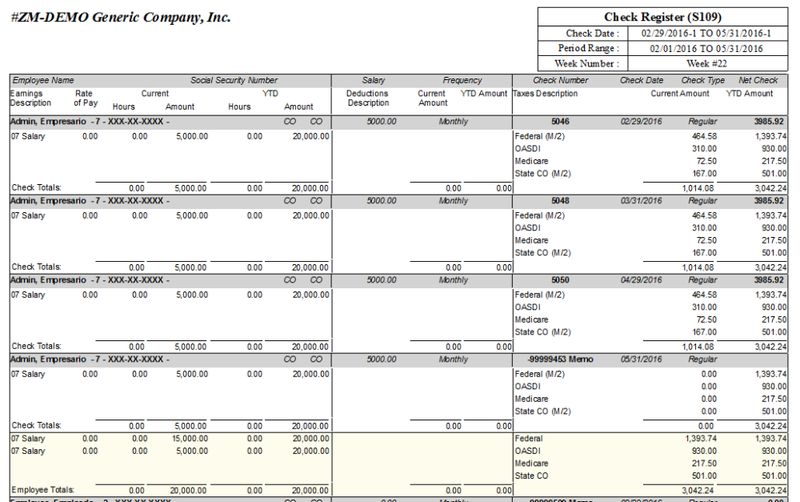 Check Registers can be displayed either way, but keep in mind the check register report is showing the employees based on their "home DBDT" thus if you are attempting to pull labor figures and you have an employee that works in multiple DBDT's; it would be better to extract that data via the Labor Distribution Report as it would list the employee costs in each DBDT they worked. Sample of Report Run across multiple payrolls;, Grouped by Company, with Group Type "Summary"